My son learned to tell time without us having to push him into it. The basics has to be there, though. At 1 year old, he already knows how to count from 1-20 or so. When he was already familiar with the numbers we gave the hour and the minute hands names. The hour hand, we called “short hand” and the minute hand, “long hand”. This allowed for him to identify which is which. He got interested as he read the numbers on the actual clock that we have on our kitchen wall. Until we moved on and started with hours or the “o’ clock” phase. 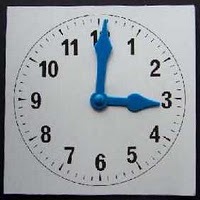 You can also make your own “teaching clock” made of paper plate, with fastened cardboard papers for the hands. We started counting by 5’s, which he had fun with. It will also help if you get your child his own watch, whether a Panerai or an ordinary one, the important thing is it is an analog watch. Getting your child a digital one will defeat the purpose of giving him a watch to begin with. A schedule will also allow for the child to be more conscious of time. It is like teaching the child what he needs to learn as it happens. This takes away the pressure from the child and it can also encourage him to figure things out at his own pace.